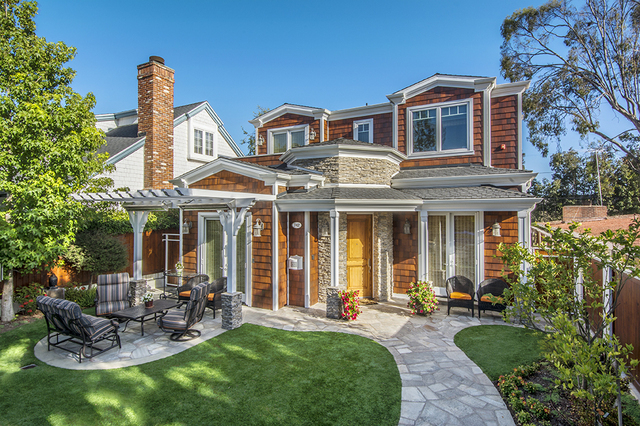 Perfect for entertaining family and friends, indoors and out, this stately 5 bedroom/5 1/2 bath home sits on a quiet street in the highly sought-after Manhattan Beach Tree Section. Inside, this 3,973 sq. ft. tri-level home features a gorgeous gourmet Kitchen equipped with professional-grade appliances, adjacent Family Room with lovely fireplace, formal Dining Room with coffered ceiling & wainscoting, and an elegant formal Living Room with fireplace. Enjoy the sound system with speakers throughout the home and state-of-the-art easy touch lighting, accessible from your mobile device. The Office/5th bedroom boasts handsome built-in cabinetry and French doors. Downstairs, a huge Great Room offers ample space for play and media/storage. Outside, the relaxing front patio features a trellised outdoor dining area and beautifully landscaped, enclosed front yard. Through French doors, the west-facing side patio boasts elegant stone hardscape, built-in stainless BBQ, concealed outdoor heaters and a graceful water feature. A 3-car alley garage, security system w/ cameras, White Oak hardwood flooring, granite and marble, crown moulding and quality designer touches throughout make this home one-of-a-kind and truly special.